It seems that there is an increasing push for children to interact with electronics or toys that resemble electronics or have electronic components and less emphasis is put on physical activity and understanding the important connection that exists between physical developmental milestones and learning. While much is known, much is also unknown about how the achievement of developmental milestones, such as crawling, impacts higher learning skills. According to Heather Haring, OTR/L, benefits of crawling include stimulating cognitive development, hand-eye coordination, cross lateral movement, and binocular vision. In a nutshell, when a baby learns to crawl, the baby develops many skills needed for higher learning – reading and copying from a blackboard, communication skills, comprehension, memory, hand-eye coordination for writing and other tasks, and the trunk strength to sit upright while learning. · Be sure babies spend adequate time on their tummies to strengthen their upper bodies in preparation for crawling. Introduce brightly colored toys to attract their attention and stimulate their desire to reach or move toward the toy like the melody snail. · Encourage babies to reach and scoot toward a brightly colored toy, such as our Sassy crib and floor mirror or our Edushape Hug-A-Bug cushion with brightly colored bugs that make noise and vibrate. 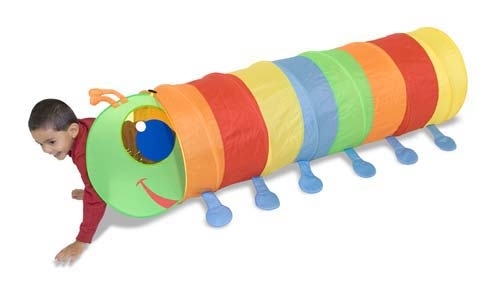 · Purchase toys that encourage children to crawl, such as our fort or tunnel. · If your child is already past the crawling stage, consider toys and games that are entertaining and foster the development of memory, hand-eye coordination, use of the upper and lower body independently, or that require coordination of both hands or both hands and feet to stimulate different parts of the brain. View our toys in the fine motor skill and cognitive skill categories. · For older children, encourage physical activities that build upper body strength and hand strength, such as swinging on monkey bars or lifting small weights (be sure the weight is appropriate and the lifting is done correctly). We invite you to share our blog with friends and families with babies and young children. View Heather Haring’s full article about the importance of crawling and its connection to learning at http://www.medcentral.org/main/Whatssoimportantaboutcrawling.aspx.